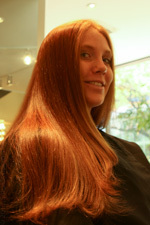 This full head color is done with either a permanent or demi-permanent color. Frequently add foils to the color for a customized, multi-dimensional look. These services are an additional charge. Does not include a style, conditioner or hair cut. Selected strands are lightened for a natural sunlit look or deepened with a darker shade for richness or boldness. Let us design a blend of colors for you, dramatic or subtle.